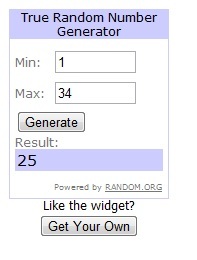 I hosted a giveaway for the month of August. If you gave me a review, you got a chance to enter my giveaway for one of three Amazon or Barnes & Noble gift cards. You all did your part, but I’ve been slow on mine. So, to make up for my obvious neglect, I’ve decided to give away FOUR gift cards to make it up to you all! Because I’ve been known to bribe my way out of things like this. Did it work? Did it? This past weekend I had my daughter Julia organize all the names and assign each entry a number. Then she used the magical random.org. (I love that guy. Err… software Sorry, too much Junie B. Jones being read in this house.) I should have had her capture the screen, but alas, I slacked off again. I’ll be contacting those people to find out what type of gift card they want. But that leaves my slacker winner, huh? (Wait. That sounds all kinds or wrong.) The person who wins this one will be praising my slackerly ways. Which means we need to become BFFs and you can remind me how my slacking is actually a good thing. For you. But then, it’s all about you anyway, right? See? We really are meant to be BFFs and I don’t even know who you are yet. I need to make a quick visit to Random.org. Hold please. I want to thank everyone who wrote a review and has helped spread the word about Twenty-Eight Wishes! And hey! The good news is I never got to strike three! Or did I? Woohoo! Guess what I’m going to use my Barnes & Noble card for? Buying Chosen when it comes out, of course! Oh my Goodness! You and your slackerish ways totally rock. I’m so excited and it’s all thinks to you um “slacking” on getting this up!!! Oh how I live you BFF! Excellent contest. Chosen sounds like a great read. Adding you to my blog roll. Congrats to the winners! I’m so glad to hear that Twenty-Eight and a Half Wishes is doing so well. Both it and you deserve it! I now believe there is a wiget for everything! A random number picker. Love it!